Hardwood Flooring: Does It Suit Your Kitchen? Hardwood is a standard choice for homeowners who want to renovate their home. But the performance and aesthetic of this flooring material depend on which part of your home you’re going to use it on. The kitchen, for example, requires flooring materials to have certain characteristics to ensure the quality remains at its best in the long term. When choosing the right hardwood for the kitchen flooring of your Orange County home, you have to consider several factors to make the most of your budget. It’s essential to find the right material that will suit specific criteria, including sunlight, foot traffic, and wear and tear. According to Consumer Reports, a new floor installation is one of the more expensive improvements you’ll do in your home. Hardwood is not an ideal flooring material for highly moist environments like full bathrooms (these include the sink, bathtub, toilet, and the shower). Exposure to moisture can also happen to your kitchen, but unlike full bathrooms, the chances are minimal. Sometimes, there will be water spills on the floor from broken water glass, overspray from the faucet, or a leak from a dishwasher. These elements can affect the quality of the hardwood. A floor sealant can help protect the floor against the moisture, but professional installation is important to make sure that water can’t penetrate between the seams. Site-finished– also known as unfinished hardwood, has a raw wood surface without stain or sealer on it. You can apply stain and sealer after its installation. Pre-finished– this type of hardwood already has stain and sealer before the flooring material arrives in your home. Among these finishes, it’s ideal to choose site-finished hardwood for your kitchen floor. Unlike pre-finished, this type of material has a thin, cohesive layer of sealant that fill in the seams preventing water from going between them. You also need to determine what method suits your kitchen before you start with the installation. 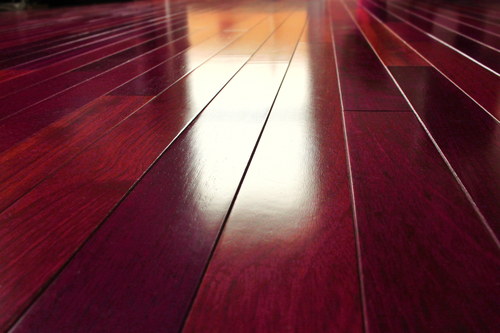 The thickness, width, and construction of the hardwood product may play a role in determining the appropriate method. Hardwood installation could be challenging, especially if you’re doing it yourself. Remember that you’ve invested in this type of flooring, so it’s important to do it right. It’s better to contact professional installers who will do the job right, saving you from costly mistakes and future repairs. Our team can help you with not only the installation process but also with choosing the right hardwood materials that match your kitchen needs. We have trained and knowledgeable staff who can assist you throughout your purchasing journey. You can choose from our inventory of hardwood flooring from reliable brands. Contact us to know more about our products and services.